Hi, I was just wondering if anyone knew what herbs that can cause or produce visions from LM? Thanks. Personally, I am very fond of the psychism enhancing qualities of Star Anise. It has a wonderfully symbolic "eye" shape and adding a bit to Psychic Vision incense powder is immensely potent. Some workers rink it in tea as well. ConjureMan wrote: Personally, I am very fond of Star Anise. It has a wonderfully symbolic shape and adding a bit to Psychic Vision incense powder is immensely potent. Thank you, I may try that! I have been practicing magic for four years. I have reached a point where I feel I need guidance from a teacher in the form of a spirit. There are only so many things that one person can teach another person, and somethings can't be easily put into words or from this plane of existence. A few magickal systems invoke the aid of a Holy Guardian Angel. There are very old and tried methods to reach ones Holy Guardian Angel yet not guaranteed to produce it. I have tried these methods, and came away not with knowledge and conversation of my Holy Guardian Angel but understanding that my need is more instruction in magic and less spiritual evolution. Is there something that hoodoo can help me in attaining an other-worldly guide? I hope someone can help. I am at a cross roads and could really use assistance. I strongly suggest that you begin by establishing an ancestral altar for the purpose of ancestor veneration. Calling on the spirits of the beloved dead can greatly enhance your magical practice and even aid you in divination. My own work is spirit led and I owe a great deal of my success to my dear departed family. Once you've prepared a suitable altar space, try to gather grave dirt from as many relatives as possible. Research the LM webpages to find the traditional method of gathering and paying for the dirt. Begin making offerings on a regular basis, burn candles for them and keep out fresh water on the altar to attract the spirits and aid their manifestation. Some supplies that will help you with this work are Acacia and Althaea roots / leaves, Kananga and Florida water for scenting offerings of water and dressing oils, like Spirit Guide, Master Key or 7-11 Holy Oil. Taking the time to practice ancestor veneration will add a new dimension of fulfillment and power to your conjure work. Good luck! Thank you Michelle for your reply. Most of my ancestors are buried in far away places and the ones near me are in stone crypts or cremated, as luck would have it. I was planing such an altar some years ago. It seems like a good idea, but my family seems to have a post-mortum fear of dirt. After I posted my question, I came a cross a couple of products in the LM catalog. One group of products was labeled "master key" and another call "spirit guide." Both products had a small descriptions, but I'm not sure if these would help my situation or not. Does anybody know or not if these could help me? Your interest in securing Knowledge and Conversation of the Holy Guardian Angel is too far afield from the kind of folk magic we practice here, and to which my shop, the Lucky Mojo Curio Co. devotes its energies, for me to be able to help you. This is not a board on the general practice of magic. It is about the folk magic of the Southern USA. 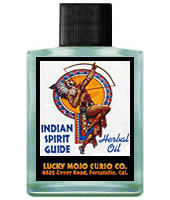 Spirit Guide and Indian Spirit Guide are formulas for herb-based oils that come out of the African American Spiritualist Church tradition. Master Key derives from the old circa 1910 popularity of the New Thought works of Charles Haanel, L. W. DeLawrence, et al. Finding a spirit guide is not necessarily a bad thing, but I'm of the school of thought that just because someone is dead doesn't make them smarter, or suddenly privy to magical knowledge. If a person wasn't a spiritual worker before hand doesn't mean they'll suddenly have such knowledge when they're dead. However, setting up an ancestor altar would be most beneficial because there is wisdom and power in the tradition that is often embodied by our elders and those who love us dearly. There could be no better guide on the best course of action than those who love you. While this is not exactly magical knowledge that they impart, they *will* impart wisdom and guidance that can be beneficial in your work, as dear Michelle said. However if you are seeking "magical knowledge" then you want to seek out an actual teacher. Someone who is part of their tradition. For conjure, I highly recommend looking into Miss cat's correspondance course. Astral Projection... If anyone here is familiar with it (seems alot of people I mention it to even when they say they are 'into' magick and what not have no idea what it is) is something I've been attempting for years, I've had a few experances here and there but nothing to note. Anyway I saw on here that there are some spell kits that aid in visons but I doubt they'd be on the same level as AP I'm wondering if anyone here has any experance and if anyone could think of a spell or some work that would really give decent aid? Astral Projection is a term used by people working in other traditions. In hoodoo there is a belief in the gift and ability to dream-visit someone, sometimes called "dream walking" or "spirit visiting" someone. It is not unlike Astral Projection, but its purpose is more practical and aimed at influencing someone. 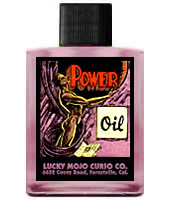 If you are looking for something to aid in any magical ability or spiritual gift then look into Power products and Mastery Key products, especially combined with Psychic Vision. Interesting... I had a manger once when I worked in PA that mentioned dream walking. he said he learned it from a native american? anyway I'll look into that thanks. Shadowy, Cat writes in her book that Hoodoo has some bits and pieces imported from Native American traditions. Makes sense since attempts were made to turn Native Americans into slaves at one time. Not a huge stretch to imagine them intermarrying and have children with the African slaves. And when two cultures are pushed together, some melding takes place. Could be that's where the term 'dream walking' entered Hoodoo. Although that's is mere speculation on my part with what little I know of Cultural Anthropology. Yeah I looked into it Dream Walking is a Native American term but it does appear in Hoodoo as well a bit interesting. I'd have to say your theroy is the most probable Maljen. Hi, I have had this hunger for knowledge all of my life, but have no idea why. I have seen the dead, talked too and even dreamed about people that I dont even know but have seen before and what happened to them in their lives. I have tried different religons, read many many books but I am still confused on what I am suppose to do with all of this. Sometimes when I walk pass a person and this does not happen often but I am stopped to tell them something. It could be something they were praying for or someone who isnt here any more that wanted to tell them something. I have been reading books on Witchcraft, Rootwork, Astrology, Parapsyhcology, Quran, Torah, King James version of the bible along with what ever else since the age of seven. I have seen things that scared me and some that I was calm with, but I am so pulled to this and I dont know why. I dont know my birthfamily, but I have a strong feeling that this is who I am meaning Hoodoo, Rootwork or whatever you call it. Everytime I've tried to leave it alone, I end up right back to it. It's like it is installed in me to know this stuff. I just bought the book Hoodoo Herb and Root Magic months ago and when I got it in the mail. I mean, I take care of that book like it's my other bible, no lie. Although I've only bought, I think one other thing prior to the book. When I am able, I plan to buy a lot more until I feel that I am able and ready to take the course. Sometimes I wish I could move closer to Miss. Cat so that I can be around people that I feel is like me, thats like family to me and not feel lift out or alone. My kids want to get involved and it makes me happy because they want to do it or they would do it on they're own. I dont know what part of that was a question, but I hope that you can understand and help me. I'm not going to run from it any more and just go with the flow of thing's. You might want to start with a reading for guidance into what rootwork practices might suit you on your quest for development. I'm interested In incense recommendations for LM products that will aid in meditation, pathworking, and trance work. psychic vision is a great product. Psychic Vision, Spirit Guide, and Indian Spirit Guide for shamanic and trance work. Tranquility and Blessing for quiet meditation. Master Key for occult magical works. 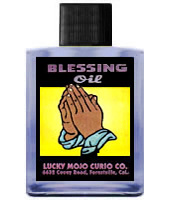 Holy Oil for seeking God's blessing on one's spiritual journey. Personally, I rather like a mix of Myrrh and Frankincense resins for such things. Myrrh can bring a lot of "depth" to meditation and trance, owing to some of it's chemical constituents. I personally love the Psychic Vision incense for this...as well as home ground frankincense and myrrh. And what do you do with the light bulb once you have added these incenses to it? Do you screw it into a lamp and turn it on? this doesn't sound particularly safe heating incense this way..... Or simply set it in front of you? You don't put incenses on the lightbulb. You draw a cross or a sigil with the oil. But some people just drop stuff right on the bulb and then turn the light on. You can also get ceramic rings that you put oil onto and then place on a lit bulb. It heats up and disperses the oil into the air. I prefer oil diffusers, personally. J82 gives good advice. Becoming more skilled through practice, and then through taking Cat's class is a fantastic way to develop your gifts. You can also consider having a reading done with an AIRR worker to see what gifts you may be particularly well suited with, and can also hire many of them for magical coaching sessions on subjects that you are interested in. http://www.readersandrootworkers.org. I would suggest that if you don't already you begin honoring your ancestors - that will go a long way to support and aid your practice. Also work with Psychic Vision and Master Key products to help open up your natural skills. I have been advised to work on developing and strengthing my intuition and to not solely go on my gut reactions. What line of products should I use? Clarity? Wisdom? A combination of the two, or something entirely different? I would go with Psychic Vision along with King Solomon Wisdom. You could also add some Master Key in there, as it helps you master all manner of spiritual and occult abilities. Psychic Vision would be my first item of choice, followed by Spirit Guide, Indian Spirit Guide, and Clarity. For the last few months I have been having psychic visions while I am asleep, right around the time before I wake up. They are definitely very different from dreams in that they are real or realistic scenes nothing fantasy-like. In the forms of memories or predictions of the future. I would like to remember them better and in more detail when I wake is there anything I can do to strengthen them or make them more powerful? Right now I am remembering little bits throughout the day and/or as the prediction is happenening in real life I get a flash flood recall of the vision. I would like to have the recollection before the actual occurence. Psychic Vision products is great for this. You can light a candle, take a spiritual bath, or anoint yourself with it. Also consider some Dandelion tea. I sleep with poppy seeds in my pillow case to help me, it has helped. Psycic Vision as mentioned above are good, but they need to be properly and specifically prayed over to remember and vivify your dream images. Consider cleansing on a regular basis to clear the senses before going to bed and apply Psychic Vision after. Clarity Products and Master Key Products may also help. Using and improving memory during the day will improve the recollection of dreams a lot. If you use Psychic Vision baths your should use hot water and soak in it rather than using a traditional drawing procedure. It will help you relax, an essential ingredient in rememberance. Thank you everyone for your responses I had not seen these before today. I have all those products mentioned above including all the oils that I purchased from LM but was not sure how to use them. I will definitely take a psychic vision and burn a dressed candle. I think that Monday is best for psychic vision spells correct? I will start drinking the dandelion tea as well as putting poppy seeds in my pillow. 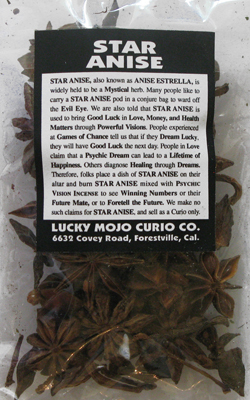 Has anyone used star anise to aid in psychic visions? and if so how? I've used Star Anise in a variety of ways--mojo hands, baths, and part of candle work. In one work aimed at increasing psychic ability I used a skull candle, dressed, loaded, and baptized in the clients name. I then stuck a Star Anise on the skull candle's "third eye." It worked very well for the client. But Star Anise can be used like other herbs. Thank you ConjureMan Ali. I just feel very drawn to the Star Anise. I have added it to incense before and have noticed that when I do it helps with visions. Can I do this skull candle on myself? Would I have to baptize it if I can or just work it normally? I haven't read anything about these types of powers being a part of Conjure, but Conjure and psychic powers are both something I'd love to master. Does anyone have some suggestions or theories on how to do this? Last edited by Joseph Magnuson on Sat Jan 14, 2012 9:07 pm, edited 1 time in total. The use of Master Key (http://www.luckymojo.com/masterkey.html) and Psychic Vision (http://www.luckymojo.com/psychicvision.html) products can help, as can magickal coaching by an AIRR member. ConjureMan. Luckbewithme876, did you ever see the movie Eve's Bayou? Mozelle's gift is a perfect example of the use of psychic powers in conjure. 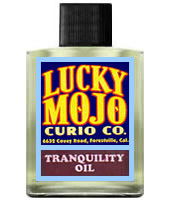 I agree with Aura, Lucky Mojo's Psychic Vision products are incredible! One of the very first things I ever bought from the Lucky Mojo was a Psychic Vision Spell Kit to help strengthen my natural abilities... the results were amazing & immediate. Conjure has all sorts of psychic talk; you'll hear lots about having the "sight," "visions," gazing into a crystal ball, reading people's spirit, dreaming true, prophesying which can all be categorized as psychic abilities. As to psi or psychic abilities revolving around psychokinesis while there is no direct mention, you'll find that really talented root doctors are gifted in rather palpable ways. For example in Jim Haskins books he mentions a slave owner talking about one of his females slaves who was a roots woman and she had powers of mesmerizing and could pick up and handle deadly snakes (Gift of Spirit too). There is also reference to Dr. Buzzard's ability to cause physical pain to people with his look. 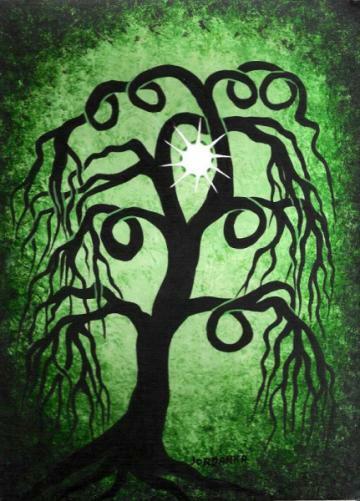 In my travels I've met root doctors with various psychokinetic abilities, though these were viewed as merely a result of their gift, not something they studied or tried to cultivate. For example, a Georgia man could snuff out candles just by focusing on them. He said he used the ability to snuff out candles that were being burned against him. In Chicago, another man could make pens and other small objects move. He called it a Gift from Spirit, not psychokinesis. He also had a strong gift for prophecy. In addition to my divinatory abilities, I have some psychokinetic abilities but this was cultivated via work with other spirits. So as you see psychic ability certainly exists in conjure and is deeply related to spirit. To help develop your sense work with Psychic Vision to help develop other spiritual and occult powers work with Master Key products. All fascinating stuff guys. Thanks for the help. @ ConjureMan Ali so Gift of Spirit/telekinesis is something that you really can learn from scratch like any other magical skill and not an innate talent? I've actually heard it both ways from different people. Also, I'm planning to eventually take the course on magic. If I were to create a Mojo Bag for this sort of thing, what should go in it? I know Master Root should go into it, and it should be dressed with Master Key Oil. is there a mineral or animal product that would be good for it? And which charm would work the best? 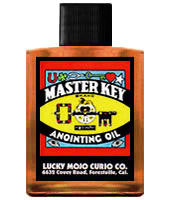 Master root and Master Key oil are not necessarily obligatory parts of a mojo bag - it all depends on what you're making the mojo for. Those ingredients could easily be completely inappropriate. Let me be more specific; I'm making it for psychokinesis and other types of psychic powers (ones that wouldn't be covered under "Psychic Visions Mojo Bag"). ConjureMan Ali Master Key products would work well, and the description for Master Root makes it sound like it would be good for psychic powers. To begin a ritual setting up my altar for removing any negativity which could interfere with the success of my work, I need these items. Found item 2 on your store website, and item 3 can be had in a church, but cannot find items 1, 4 anywhere. Are these items 1, 4 still being made or is there a substitute? Last edited by Mama Micki on Tue Sep 18, 2012 5:42 am, edited 3 times in total. 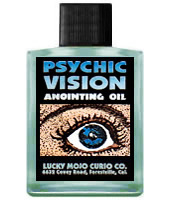 Lucky Mojo does carry Psychic Vision products (your Item 1), including a vigil candle. All Lucky Mojo vigil candles are dressed with oil, herbs, and prayer. For item #4, Aura of Enchantment, you might try Lucky Mojo's Attraction, Bewitching, or Master Key. 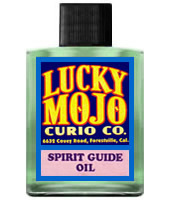 Mama Micki wrote: Lucky Mojo does carry Psychic Vision products, including a vigil candle. All Lucky Mojo vigil candles are dressed with oil, herbs, and prayer. Hello I would like to know if there is anything a rootworker can perform to help a client develop mediumship? Or is there any products that will help with this.. I ask because I would love to develop my mediumship but feel i may be blocking myself. Thanks in advance. Good luck on your journey Starfinder. Starfinder, you can use any of the Psychic Vision products (http://www.luckymojo.com/psychicvision.html) to help with mediumship. Dress a white or blue candle with Psychic Vision oil and burn it along with some Psychic Vision incense. Pray for an increase in psychic ability, and ask the Lord to send helpful and benevolent spirits to help you. Also, check out the Missionary Independent Spiritual Church... most Spiritualist Churches offer guidence (through written materials or online forums, etc. for developing skills as a medium). You could also go to the crossroads.